Add a drop shadow (box-shadow property) to your entire design or to individual blocks. Learn how to add a drop shadow in Modern Editor and review email client support to understand where this trendy technique will be best supported. The drop shadow technique will work pretty well in most web email clients. Browser support is very good. Unfortunately, as with many trendy techniques, this does not work in Outlook PC. It does work for Outlook Mac. 2. Click on the STYLESHEET tab from the edit content panel (left side). 3. Under ESSENTIALS, click Background. 4. Click open the Email Container element. 5. Select CSS from the right side in this section. See how your drop-shadow has been applied! You can change the length and blur of the shadow by adjusting the pixel coordinates. Adjust the color of the drop shadow by changing the color code. You can follow these same steps to add a drop shadow to all your text blocks or all your image blocks. Under the STYLESHEET tab go to the SINGLE BLOCKS section to open the Text or Image block styles, click open the Container element, select the CSS and add the same code. 2. Click on a text or image block from the preview panel (right side). 3. 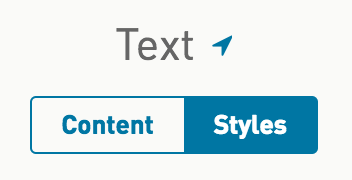 Click the STYLES tab of the block from the edit content panel (left side). 4. Click open the Block Container element.